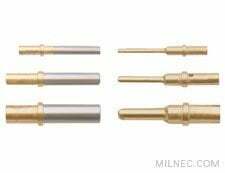 EV Series M83723 crimp style contacts are machined from copper alloy and are gold plated for the highest electrical continuity and corrosion resistance. The series offers contacts in sizes #12, #16, and #20, which are suitable for 12-24 AWG wire and are rated for up to 23 amps. In addition, thermocouples are available in sizes #16 and #20. Sealing plugs are required for any open positions in a connector to maintain reliable environmental protection. Dimensions are in inches (mm) unless otherwise noted.